Show Recap & Photo Gallery: Weezer Open New Natick, MA Microsoft Store in Rockin’ Fashion : TheyWilllRockYou.com – For the love of music! Serving Boston and Greater New England. Microsoft has been on a roll lately, welcoming dozens of stores across the U.S. over the past year. With each opening, a great musical act is featured, making these events particularly fun. Last year’s opening of the Boston store brought Lenny Kravitz to the Bay State. And this past Saturday, Boston’s Metro West residents saw the ushering in of a new store in Natick with alt rock band Weezer as the musical treat. Microsoft made sure that the “pre-game” was fun for everyone as well – there were cool product demonstrations (Xbox, Windows Phone 8), a raffle (everything from games to a Weezer-signed guitar), and delicious food from The Cheesecake Factory. And as a very special treat, a meet-and-greet with Weezer! At 7pm, Cuomo & Co. took the stage, and played a fun, energetic set that kept the crowd moving, dancing and singing along. They played both deep cuts and hits, to the great satisfaction of the fans – some of whom slept out the night before in order to secure tickets. Band members were easy going, seemed to be having a genuinely fun time, and appreciative for the opportunity – all while whaling away on song after song. 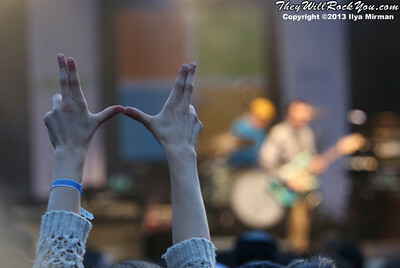 It was clear that Saturday night, Weezer expanded their fan base. Here’s to more Microsoft Store openings! Check out our photos from the day below and if you missed the free show, Weezer will be back in New England for a show on July 8th at Club Casino in Hampton Beach, NH. You really captured the heart of the show, great photos, Ilya! I love that you shot the show from different vantage points! What a great night! I felt like I watched the show all over again by looking at the photos. Thanks to Weezer and Microsoft for a great show!